It was when I first started social networking, in 2006, that I came across the Myers-Briggs Type Indicator (MBTI). Two months into using the now almost defunct MySpace, I was in correspondence with an American man who asked what type I was. I did not, at the time, have a clue what he meant but since doing my first psychometric test I haven't looked back. Broadly speaking, the MBTI was developed by Isabel Briggs Myers and her mother. Katharine Cook Briggs, over a period of 40 years, based on Carl Jung's work. Click here for a detailed history of Isabel Briggs Myers. The test itself is a series of psychometric questions which one should answer with whichever answer is the closest fit. Depending on how you answer these questions you are then given 4 letters which indicate your personality type. These letters represent "preferences" or a preferred way of thinking or acting. The four areas ("preferences" or "dichotomies") are spectrums and we can fall anywhere on the scale. This does not define us, or try and predict how we will act in any particular circumstance, it is, as it is named, an indicator. The first letter will be either I (for Introversion) or E (for Extraversion), followed by S (for Sensing) or N (for iNtuition), then T (for Thinking) or F (for Feeling) and finally J (for Judgment) or P (for Perception). 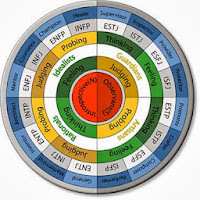 The terms used are particular to Myers Briggs and not to be taken literally, For example, we generally use the word extroverted to describe a person who is gregarious, but in this case, the actual word used is extraverted, and for MBTI it refers to somebody as preferring to focus on the world outside the self. We can be both introverted and extraverted at different times and the indicator simply reflects our preferred, or more distinct way of being. There are 16 personality types in all, some more common than others. You can do a free MBTI online test here and there are some good pages on explaining the different types here. Something that I have found very interesting - the first few times I did the test I came up with the same four letters. Then after training to be a counsellor, which required a lot of soul searching, personal therapy and attaining greater self awareness, my MBTI changed, by 2 letters. The most significant one for me was that I was E (extraverted) and now am I (introverted) admittedly, my E scoring was quite low (you will be given a number after the letter which indicates how far up the scale you are). During my studies, I had a conversation with a peer who regarded himself as introverted and we mused on whether, as we develop our selves, we would slide along the MBTI preference scales to be somewhere in the middle. It would be an interesting experiment and I may just look into doing a little bit of research. Hasn't changed much over the last few years. My wonderful brother has the same type. Your T prefernce is very low so your type is very close to mine (I am INFJ). It is really good to know your personality type because it gives you a better understanding of yourself. I will definitely try this.